The Institute of Culinary Education is a private culinary arts school located in New York City, New York. 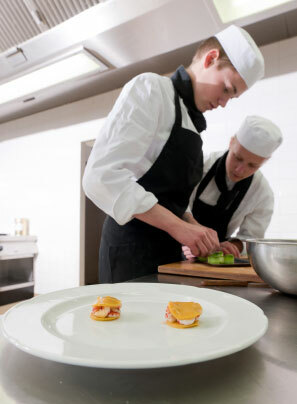 Students who wish to pursue a career in hospitality and the culinary arts are encouraged to investigate the curriculum of this well-known school. Immersion studies within four disciplines characterize the diploma programs at this school. Culinary Arts, Culinary Management, Pastry and Baking Arts, and Hospitality Management programs prepare students for immediate employment in their chosen fields. The school is also famous for its array of non-diploma courses, offered by the Recreational Education department. As a continued service to alumni and other culinary arts professionals the Institute is also active in the areas of Professional Culinary Career Development and continuing education. The Institute of Culinary Education dates back to 1975, when it was known as Peter Kump's New York Cooking School. The school was one of the first schools to emerge on the New York scene, and Peter Kump was known for teaching technique and foundations rather than just recipes. Kump started slow by teaching five students a protocol of basic cooking techniques. After a favorable review from the New York Times and inquiries from interested potential students, Peter's Kump's New York Cooking School was born. The formal learning environment took shape in 1983 when Kump tapped his own former instructors, like James Beard, to teach at the school. Subsequently, heavy hitters in the industry like Julia Child and Jacques Pepin joined the likes of James Peterson and Sara Moulton as guest instructors at the institute. In 1985, Kump established the James Beard Foundation in order to showcase and inspire chefs, and promote the culinary arts with festivals, dinners, publications, and a prestigious awards program. The school's baking program was launched in 1986 by Chef Nick Malgieri and continues to offer an industry leading Pastry and Baking Arts Diploma. When Peter Kump died in 1995 the school was acquired by culinary entrepreneur Rick Smilow and began expanding professional programs. Growth spurred a move to its current Chelsea neighborhood location in Manhattan. 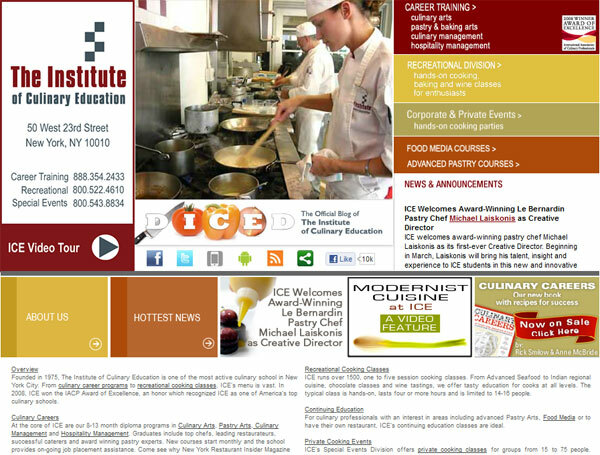 The school's name was changed to The Institute of Culinary Education in 2001. The Institute of Culinary Education was accredited by the American Commission of Career Schools and Colleges of Technology (ACCSCT) in 2000. The institute was honored for four separate areas of "levels of excellence," in student satisfaction, facilities and equipment, faculty and instructors, and community service. The Institute, its graduates, and its instructors have been given a number of awards and honors since 1997. Peter Kump's was named the "best cooking school in New York" in New York magazine in 1997. The magazine subsequently included the school in its "Black Book...the World's Best Addresses" in 1998. Pastry & Baking Program Director Nick Malgieri was named by Pastry Art & Design magazine as one of "America's Ten Best Pastry Chefs" and was inducted into the James Beard Foundation's "Who's Who of Food & Beverage in America." In 2008 Joseph Wrede was listed as one of the "best new chefs in America" by Food & Wine magazine. James Beard Foundation Outstanding Chef awards were granted to graduates Stephen Durfee and Claudia Fleming in 1998 and 2000, respectively. The International Association of Culinary Professionals has designated the Institute as the Culinary School of the Year on two occasions, and magazine features in Saveur and other industry publications identify the school as one of the food world’s most priceless treasures. The theory, practice, and art of cooking is covered in the Institute of Culinary Education's Culinary Arts Diploma Program. The unique program focuses on its own 5 point course of study in skill development, theory, technique, palate training, and teamwork. There is no shortage of formal instruction time for students since, in addition to the intern requirement, the program employs a comprehensive 650-hour curriculum. By progressively building on the subject, the school is able to lay a solid foundation for chefs to build on. The first step is allowing the students to taste. As subtleties in a wide variety of foods are understood, techniques such as knife skills, cooking methods, sauce making, restaurant simulations, and pastry and baking practices are conveyed. Students’ focuses grow from consistently producing basic foods, into learning how to prepare complex dishes and create menus. The program involves a 210-hour externship, which allows students to put their skills to the test in settings like restaurants, hotels, and catering kitchens. Food evaluations and group tastings are an important part of each days training because they afford students the opportunity to continue developing their understanding of what is a kitchen success, and what is a flawed dish. Though it is based in French technique, the program uses ingredients and techniques from countries around the world. The Industry is truly global as mobility has become a part of life, so students are exposed to Asian, European and Indian cuisine. By tasting and cooking with a variety of the world’s indigenous ingredients, students emerge from their training with a global palate that makes them better chefs. Small class sizes are employed by the school to give each student an active stake in the instruction process, and homework is an integral part of preparing for upcoming lessons. Your culinary arts education is short and focused at the Institute, but it is comprehensive due to the instructors’ efficient management of the course material. The diploma usually takes about 13 months to earn, as compared to a standard two-year Associate’s Degree. Lean on the fast track offered by this school if you want instant kitchen cred and a prompt paycheck. The Institute of Culinary Education's Pastry & Baking Diploma was created and overseen by Chef Nick Malgieri. Malgieri is a TV personality, world-renowned author, and former executive chef at Windows on the World. Malgieri also has a number of accomplishments and culinary honors to his credit. His books, Chocolate and How to Bake are not just casual cookbooks; they are industry standard setting revelations. 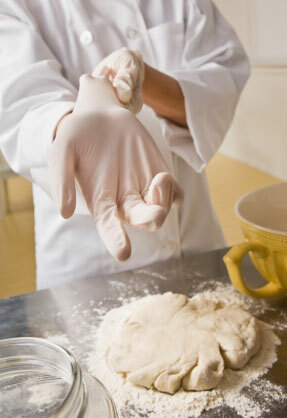 The program grants hands-on experience in breads, cakes, confections, and frozen desserts. Group tasting and a critique of the work done by the chef-instructor ends most lessons, so students are able to develop their palates, identify successes, and learn to solve related problems. Homework is given to make students aware of upcoming topics. This program also utilizes a 210-hour externship. Austria, France, Italy and Switzerland provide classical baking traditions that students study as part of the Institutes international curriculum. Old-world baking is juxtaposed against modern American technique to expose students to a variety of influences that define the pastry arts. Ingredients like sugar and eggs are put under a virtual microscope to break them down to a molecular level, in a way that equips students to produce consistent results from key recipe components. If making gourmet chocolates and decorating cakes sounds like a fun way to spend your workday, then The Institute of Culinary Education is your portal to the skills and knowledge you will need. Piping, drizzling, dipping and balancing your batter take on new meaning to trained professionals who have been indoctrinated into the fine art of pastry and baking. Get the job done for yourself in around one year’s time by grabbing this sweet diploma. The Institute of Culinary Education's Culinary Management Diploma is a program designed for those who wish to manage, grow, open, or own a culinary business. The program is taught with a practical focus that incorporates an entrepreneurial viewpoint. Because the diploma program provides a comprehensive business education it can be applied to work in other fields. The New York State Department of Education has licensed the program as a "business diploma." Often a chef is building a career resume that will eventually lead to an owner/operator role. Building kitchen prowess is one thing, but the business education required to effectively manage a food and beverage venture should not be overlooked. The restaurant business is one of the most volatile industries available for entrepreneurial pathways. Far too many well-trained chefs do not rise to the level of restaurant success warranted by their outstanding food creations, because they lack the fundamentals required for keeping the money ball rolling forward. Proper education can reduce or help minimize this disparity. The program attracts a diversified set of backgrounds and aspirations, when it comes to students. Areas such as menu, marketing, supervising, finance, law, sanitation, cost control, communication, and facilities management are taught to enrollees from all disciplines. For business professionals seeking a career direction change, this diploma program provides an opportunity to retool their existing business consciousness for better application to the food service industry. The proof is indeed in the pudding, so diploma instruction includes getting out to meet local industry entrepreneurs. Access to owner/operators provides a real world source of knowledge that comes from the experts and offers valuable insight into local restaurant operations. Where are the best food markets? Which trade shows provide the best industry coverage? How did you finance your venture? Personal networking and tapping professionals for business insight are solid components of the Institute’s Culinary Management Diploma program. The Institute of Culinary Education’s Hospitality Management Diploma Program prepares graduates for employment in the hospitality industry that does not necessarily require knife skills or baking experience. Travel and hospitality industries run parallel to the culinary arts in that they all involve hungry people. Hotel and resort facilities are tasked with feeding guests, and many do it admirably. What better way for a property to set itself apart from the competition than by elevating its food quotient? Cross training in Hospitality Management opens doors throughout the industry for management level candidates. Similar skills are employed across disciplines like restaurant management and hotel front desk management. Graduates from this diploma program might find employment positions at resorts and spas, restaurants, bed and breakfasts, travel agencies, car rental firms, campgrounds, cruise lines, forest and recreational parks, hotels and motels, state and national parks, extended stay and retirement homes, railroads, amusement parks/attractions, or in tour operations as guides, tourist advisors, flight attendants, country club managers, convention and meeting planners, and visitor’s bureau staffers. Young people embark on hospitality careers because the industry promotes from within and rewards hard work. It is a rare opportunity for rapid advancement that leads to brilliant long-term careers. But at some point in a hospitality professional’s progression, a formal education provides a leg up to the next level. A Hospitality Management Diploma from the Institute plugs-in perfectly to your practical resume when it’s time to amp up your education credentials. The Institute is committed to providing continuing education opportunities for practicing professionals seeking to elevate their understanding of a particular area of the culinary arts. A food journalism program called Center for Food Media provides training in food writing, recipe development, blogging, cookbook editing, food history, and restaurant reviewing. Expert Writers convey knowledge from the field to bring possible food journalism careers into perspective. International recognized guest instructors teach a program called CAPS ICE, or Center for Advanced Pastries Studies-ICE. Confections and revolutionary approaches to modern art inspired pastry production are illuminated during multi-day courses of study designed to elevate working pastry chefs’ creative limits. Spanish, French, Japanese and Italian study programs are cultivated at the Institute so students can take short jaunts abroad or participate in more lengthy ‘stage’ externing opportunities. Alumni and general participation is encouraged in programs that can quickly expand culinary minds by placing working chefs in unfamiliar culinary territory. Closer to home, the school facilitates a brisk flow of guest speakers who share their catering, retailing and entrepreneurial experiences within the hospitality industry. Not aspiring to become a professional cook? It doesn’t mean that the Institute’s resources are off-limits to you. The school has one of the most robust recreational instruction programs in the country. Wine training and baking are taught to amateur home cooks alongside specialties like seafood, grilling and knife skills. Students generally commit to full days of instruction in specific food areas. The hands on instruction culminates in a family style meal that lavishes student-cooks with the fruits of their labors.